I'll admit up front that there are some of you out there who really know Jaco Pastorius' own music and playing inside and out. Dare I say, there are probably more of us who know Jaco's sound from his amazing, fruitful and important collaborations with other artists and bands. 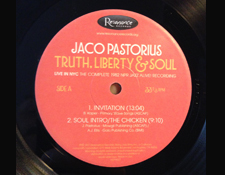 From his ascent with the jazz-rock fusion band Weather Report to his still magnificent and stunning work with Joni Mitchell -- Hejira, Don Juan's Reckless Daughter, Mingus, Shadows & Light -- and of course Pat Metheny's debut album, Bright Size Life, Jaco Pastorius' sound left an indelible mark on all of those recordings (and many others from the period). Jaco's emotive fretless bass sound and astounding technique indeed caused a revolution in bass guitar playing to the point where today he is justifiably regarded as the Jimi Hendrix of that instrument. In that light, it is interesting to consider that Hendrix' (arguably) finest documented performances -- recordings which captured his musical and spiritual essence -- were made on live concert stages. Hendrix' legacy was etched into the history books based on incendiary early live performances such as The Monterey Pop Festival and The Saville Theater in London as well as, of course, at Woodstock in 1969. To that point, I do wonder if Jaco's career might have been even better served with more live recordings released early on to complement his reputation as a spectacular live performer. Frank Zappa certainly realized this sort of "X" factor (if you will) long ago as his career was blossoming -- many of his best recordings are based on live concert recordings which capture unique moments not easily captured in the studio.